Study supports Standard Model of particle physics, excludes alternative models. An artist’s representation of an electron orbiting an atom’s nucleus, spinning about its axis as a cloud of other subatomic particles pop in and out of existence. The scientific community can relax. The electron is still round. In a new study, researchers at Northwestern, Harvard and Yale universities examined the shape of an electron’s charge with unprecedented precision to confirm that it is perfectly spherical. 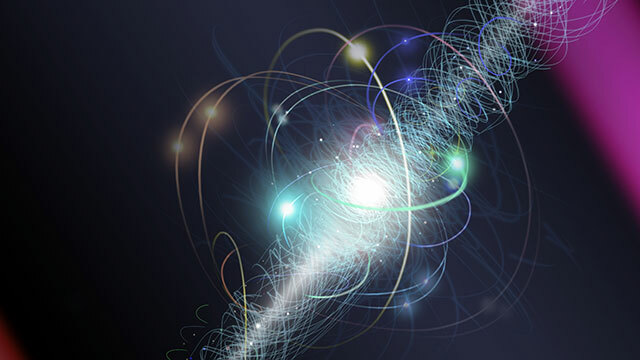 A slightly squashed charge could have indicated unknown, hard-to-detect heavy particles in the electron’s presence, a discovery that could have upended the global physics community. The study will be published Oct. 18 in the journal Nature. In addition to Gabrielse, the research was led by John Doyle, the Henry B. Silsbee Professor of Physics at Harvard, and David DeMille, professor of physics at Yale. The trio leads the National Science Foundation (NSF)-funded Advanced Cold Molecule Electron (ACME) Electric Dipole Moment Search. A longstanding theory, the Standard Model of particle physics describes most of the fundamental forces and particles in the universe. The model is a mathematical picture of reality, and no laboratory experiments yet performed have contradicted it. This lack of contradiction has been puzzling physicists for decades. Gabrielse and his ACME colleagues have spent their careers trying to close this loophole by examining the Standard Model’s predictions and then trying to confirm them through table-top experiments in the lab. These undiscovered, heavier particles could be responsible for some of the universe’s most glaring mysteries and could possibly explain why the universe is made from matter instead of antimatter. The ACME team probed this question by firing a beam of cold thorium-oxide molecules into a chamber the size of a large desk. Researchers then studied the light emitted from the molecules. Twisting light would indicate an electric dipole moment. When the light did not twist, the research team concluded that the electron’s shape was, in fact, round, confirming the Standard Model’s prediction. No evidence of an electric dipole moment means no evidence of those hypothetical heavier particles. If these particles do exist at all, their properties differ from those predicted by theorists. “Our result tells the scientific community that we need to seriously rethink some of the alternative theories,” DeMille said. In 2014, the ACME team performed the same measurement with a simpler apparatus. By using improved laser methods and different laser frequencies, the current experiment was an order of magnitude more sensitive than its predecessor. Gabrielse, DeMille, Doyle and their teams plan to keep tuning their instrument to make more and more precise measurements. Until researchers find evidence to the contrary, the electron’s round shape — and the universe’s mysteries — will remain.